Students from St. Jean Baptiste High School (l), La Salle Academy (top r), and Cathedral High School (bottom r) enjoyed hearing amazing stories from human rights activists at the Oslo Freedom Forum earlier this week. CSF was delighted to take more than 120 students, including many CSF alumni, to Lincoln Center earlier this week for the second annual Oslo Freedom Forum in New York. 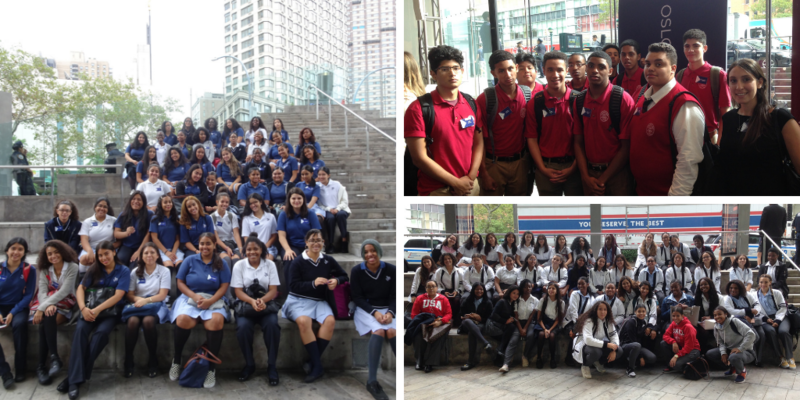 Students from La Salle Academy, St. Jean Baptiste High School, and Cathedral High School joined several CSF alums now in college for the day-long human rights conference featuring powerful stories from activists from China, Russia, Afghanistan, Turkey, North Korea, Venezuela, and many other countries. But of all the speakers, teenager Fatemah Qaderyan from Afghanistan was the one with whom the students most identified. Fatemah told her story of leading an all-girls robotics team that almost didn’t make it to an international championship in Washington, DC last year after they were initially denied visas, and beating the odds by excelling in math and science in a country where only half of all girls go to school. Tragically, shortly after her return from Washington, Fatemah’s father was killed in a suicide bombing. We are extremely grateful to the Oslo Freedom Forum and Human Rights Foundation for inviting CSF alumni to participate. As their reflections show, the students’ eyes have been opened to the human rights violations that take place in so many countries, but they are also inspired by the perseverance and human flourishing of the activist speakers despite the injustices they continue to battle. You can watch video presentations from the Oslo Freedom Forum in New York here. 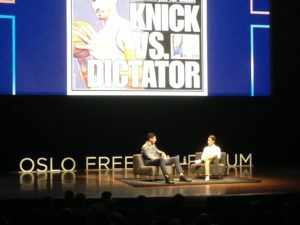 New York Knicks basketball player Enes Kanter discusses injustices in his native Turkey with Human Rights Foundation President Thor Halvorssen at the Oslo Freedom Forum in New York.